This article is about all species of turkey. For the country, see Turkey. For other uses, see Turkey (disambiguation). Turkeys are classed in the family of Phasianidae ( pheasants, partridges, francolins, junglefowl, grouse, and relatives thereof) in the taxonomic order of Galliformes. The genus Meleagris is the only extant genus in the subfamily Meleagridinae, formerly known as the family Meleagrididae, but now subsumed within the family Phasianidae. Turkeys were domesticated in ancient Mexico, for food and/or for their cultural and symbolic significance. The Aztecs, for example, had a name for the turkey, wueh-xōlō-tl (guajolote in Spanish), a word still used in modern Mexico in addition to the general term pavo. Spanish chroniclers, including Bernal Diaz del Castillo and Father Bernardino de Sahagun, describe the multitude of food (both raw fruits and vegetables as well as prepared dishes) that were offered in the vast markets ( tianguis) of Tenochtitlán, noting there were tamales made of turkey, iguana, chocolate, vegetables, fruit, and more. The ancient people of Mexico had not only domesticated the turkey but had apparently developed sophisticated recipes including these ingredients—many used to this day—over hundreds of years. Several other birds that are sometimes called turkeys are not particularly closely related: the brushturkeys are megapodes, and the bird sometimes known as the "Australian turkey" is the Australian bustard (Ardeotis australis). The anhinga (Anhinga anhinga) is sometimes called a water turkey, from the shape of its tail when the feathers are fully spread for drying. An infant turkey is called a "chick" or "poult". The Oligocene fossil Meleagris antiquus was first described by Othniel Charles Marsh in 1871. It has since been reassigned to the genus Paracrax, first interpreted as a cracid, then soon after as a bathornithid Cariamiformes. 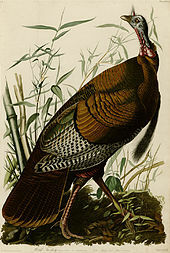 In her written memoirs Lady Dorothy Nevill  recalls that her great-grandfather Horatio Walpole, 1st Earl of Orford, imported a quantity of the American turkeys  which were kept in the woods around Wolterton and in all probability were the embryo flock for the popular Norfolk turkey breeds of today. ^ "Earliest use of Mexican turkeys by ancient Maya". ScienceDaily. Retrieved 2017-09-23. ^ a b Farner, Donald Stanley & King, James R. (1971). Avian biology. Boston: Academic Press. ISBN 978-0-12-249408-6. ^ Nield, David. "Study Shows That Humans Domesticated Turkeys For Worshipping, Not Eating". sciencealert.com. ^ a b c d Krulwich, Robert (27 November 2008). "Why A Turkey Is Called A Turkey". NPR. Retrieved 18 July 2016. ^ "The flight of the turkey". The Economist. 20 December 2014. Retrieved 22 December 2014. ^ Boehrer, Bruce Thomas (2011). Animal characters: nonhuman beings in early modern literature. University of Pennsylvania Press. p. 141. ISBN 0812201361. ^ Dicionário Priberam da Lingua Portuguesa, "peru". ^ Annear, Steve (2017-04-24). "MassWildlife warns of turkey encounters". The Boston Globe. Retrieved 2017-08-25. ^ "Preventing Conflicts with Wild Turkeys". Commonwealth of Massachusetts. Retrieved 2017-08-25. ^ Sweeney, Emily (2017-08-25). "Don't let aggressive turkeys bully you, Brookline advises residents". The Boston Globe. Retrieved 2017-08-25. ^ Formerly Parapavo californica and initially described as Pavo californica or "California peacock"
^ Bochenski, Z. M., and K. E. Campbell, Jr. (2006). The extinct California Turkey, Meleagris californica, from Rancho La Brea: Comparative osteology and systematics. Contributions in Science, Natural History Museum of Los Angeles County, Number 509. ^ Jan, K.; Andreas, M.; Gennady, C.; Andrej, K.; Gerald, M.; Jürgen, B.; Jürgen, S. (2007). 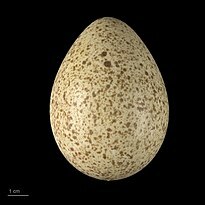 "Waves of genomic hitchhikers shed light on the evolution of gamebirds (Aves: Galliformes)". BMC Evolutionary Biology. 7: 190. doi: 10.1186/1471-2148-7-190. PMC 2169234. PMID 17925025. Archived from the original on 15 October 2008. Retrieved 15 February 2008. ^ Dalloul, R. A.; Long, J. A.; Zimin, A. V.; Aslam, L.; Beal, K.; Blomberg Le, L.; Bouffard, P.; Burt, D. W.; Crasta, O.; Crooijmans, R. P.; Cooper, K.; Coulombe, R. A.; De, S.; Delany, M. E.; Dodgson, J. B.; Dong, J. J.; Evans, C.; Frederickson, K. M.; Flicek, P.; Florea, L.; Folkerts, O.; Groenen, M. A.; Harkins, T. T.; Herrero, J.; Hoffmann, S.; Megens, H. J.; Jiang, A.; De Jong, P.; Kaiser, P.; Kim, H. (2010). Roberts, Richard J, ed. "Multi-Platform Next-Generation Sequencing of the Domestic Turkey (Meleagris gallopavo): Genome Assembly and Analysis". PLoS Biology. 8 (9): e1000475. doi: 10.1371/journal.pbio.1000475. PMC 2935454. PMID 20838655. ^ a b "Native Americans First Tamed Turkeys 2,000 Years Ago". Seeker (Discovery News). Retrieved November 23, 2017. ^ "Amazing Facts About Turkey". OneKind. Retrieved 24 December 2015. ^ "My Life as a Turkey - Domesticated versus Wild Graphic". PBS. Retrieved 27 December 2015. ^ "Why do we eat turkey for Thanksgiving and Christmas?". Slate. November 25, 2009. Retrieved December 24, 2015. ^ "Why Do We Eat Turkey on Thanksgiving?". Wonderopolis. Retrieved 24 December 2015. ^ a b Nevill, Lady Dorothy (1894). Mannington and the Walpoles, Earls of Orford. With ten illustrations of Mannington Hall, Norfolk (PDF). Reference to the Sinecure and to the Turkeys. Fine Art Society. p. 22. View the melGal1 genome assembly in the UCSC Genome Browser.